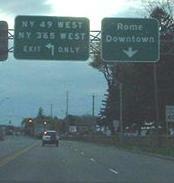 NY 365 EB loses NY 26 and gains NY 49 and 69 on the south side of Rome. WB in the same location as the second photo about to join the multiplex, courtesy Doug Kerr. NY 365/NY 49 WB about to split for opposite directions of NY 26. Mill St. SB at Martin St. in Rome. 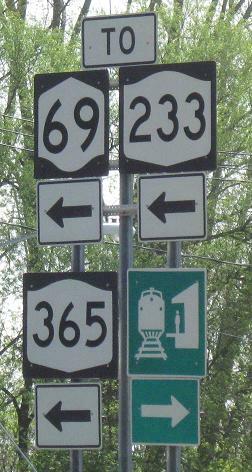 The NY 69 shield is upside-down, which is possible given that the number is symmetrical but a really tough error to justify when the other shields were installed correctly. There's a surprise on Mill St. NB waiting for you if you go over to the NY 69 page via the link below. NY 365 took over this former state highway from what's now NY 291 (then also part of 12C) to the former NY 12 junction in Barneveld. 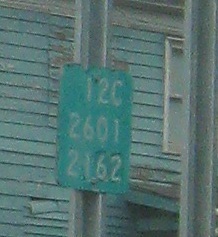 What's interesting about this milemarker is that it's on Mappa Ave. at Boon St., which originally was 12 SB at the beginning of 12C. I guess 12 and NY 28 were moved onto the divided bypass while 12C was still alive, thus extending 12C north to the current NY 365 interchange.